Spotted this on the back of a Jeep Cherokee parked in a Golden Corral parking lot. 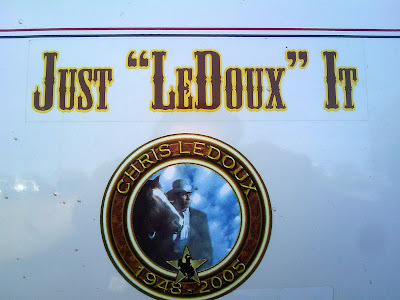 I loves me some Chris LeDoux so I had to share. If you are wondering what I was doing in a Golden Corral parking lot, Jake was in charge of dinner that night. It's not often the eleven year old in the family gets to call the shots.